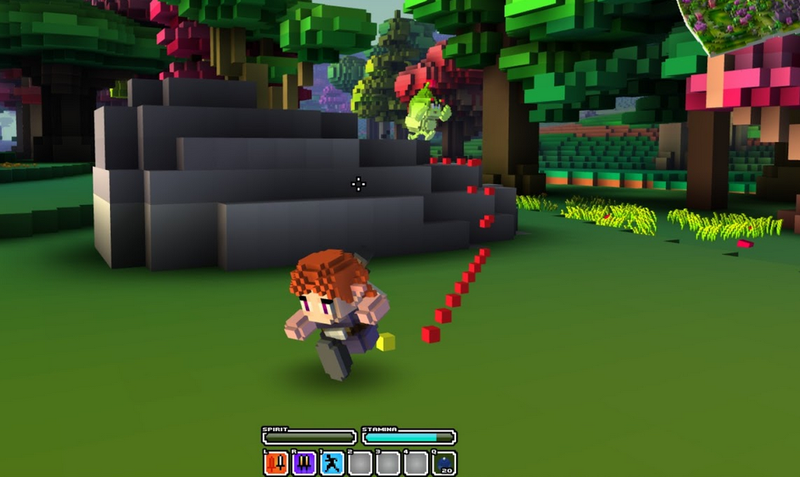 It's been a while since we've written about Cube World, the amazing-looking voxel-based RPG with a focus on exploration. Thing is, it's been kind of mum over the last few months—causing many a fan to worry. So what's been going on? Has development stopped? Where is the project right now? Is Wollay, the developer, even alive? Fans have all sorts of questions like these. The short answer is that the game is still being worked on—we'll get to that in a second. First, let's do a recap. It all started back in 2011, when Wolfram von Funck, aka Wollay, posted the first screenshots of a charming-looking role-playing game that promised players a vast, procedurally generated world. Cube World, he called it. Lots of people took notice—the project looked promising, especially since it was taking inspiration from great games like Zelda and Minecraft. Still, despite the clamor from fans, it still felt like kind of a hushed affair—Wollay repeatedly said he didn't know when the game will release. It wasn't until 2012 that another person joined the team: his wife, Sarah von Funck, who is contributing as a coder, designer and concept artist on the project. Heck, we still don't know what the official name of this thing will be—"Cube World" is just a fill-in for now, according to the developer. Last year, Luke Plunkett said that Cube World was "quietly" becoming his most anticipated game of 2012, reflective of how low-key the game's marketing and PR has been. Updates on the progress of the game weren't unheard of, of course—based on his old development blog, Wollay would periodically give updates that included new screenshots, videos, and hints of upcoming plans. Most would come once a month, if that, with updates ramping up in 2013—which is when a playable alpha of the game was planned. The catch: players would have to pay for the privilege of early access. This is where things got tricky. The alpha, which launched in July of this year, did not go as planned. Immediately, the servers hosting the game were crushed, the shop was taken down, and Wollay said things would remain down "until all issues are resolved." Initially, the assumption was that too many people wanted to play the game at a time, overwhelming the servers. Kotaku spoke to Wollay on July 8th, who told us that he believed it was actually a distributed denial of service attack, which is basically users intentionally disabling servers with high traffic. While we could not confirm this was the case, any attempts to purchase the game prior to obtaining a review key were futile; the site was often down. "Initially we assumed the fault was on our side, like our download/updating system could be broken, so we closed the sale and improved our system," Funck had told Kotaku. "But it turned out that all these problems were the result of DoS attacks. It seems that someone is trying to systematically damage us and our business. The attacks usually occur during evening/night as soon as we open our store or user registrations. The attackers obviously want to prevent us from selling our game." While the team said they were working on a fix, they gave no ETA on when players could expect to be able to purchase the game again, or when things would go back to normal. Things seemed to "settle down" on July 12th, and players have indeed been able to purchase the game, but since then, there have been few updates to the site or Wollay's Twitter. He stated he would attend the Gamescom trade show in August on his personal Twitter account, and the last update to the site was back in July 23rd, where he outlined some future steps for the game. These included improvements for their shop, bug fixes, performance tweaks, multiplayer configuration, new content, and some website changes. The game itself has also not been updated since July 23rd, according to the launcher that boots up when you start the game. That means it's been about three months since any concrete news has hit about Cube World. The new update is coming along nicely. We're still experimenting with some features and are working on an improved launcher. At the moment there's just a lot of work going on behind the scenes, like customer support, server/website development, and we're currently moving to a new appartment with more space for our development studio. There's an option for a smaller user interface, the controls will be configurable and there are a few new creatures. We're tweaking game balance to make it easier at lower levels and harder at higher levels. We're also experimenting with some major changes but I'm not sure yet which ones will make it into the next patch. The question on everyone's mind, of course, is when this is all happening—if players were anxious to get updates on the game before, the curiosity and anticipation for game updates has only multiplied now that some players have spent money on the game. Understandably. Payment begets the need for accountability. Unfortunately, as always, Wollay remains cagey on any specific time frames. "We're doing our best to release the update as soon as we can but I'm really bad at estimating," Wollay told Kotaku today. When asked if the DDoS ordeal was at all influencing how much he talks about the game now, he responded with a "Maybe" and then added that "It was a very discouraging experience." It's worth noting that Wollay has gone 'radio silent' in the past, too: just this year, there was at least one 4-month gap between updates. The slow pace of development thus far, along with the fact that it's a team of two people who are working on this as a self-described "small hobby project," make it seem as if the latest lack of updates aren't a cause for alarm—it's simply the game continuing to grow at the pace it always has, with its developer still not being as transparent as some would like. The way things are being handled might frustrate some players for sure, but it's also not a sign of an aberration. In case the status of the game ever changes, we'll keep you updated on the project.